Hello my dear friends! 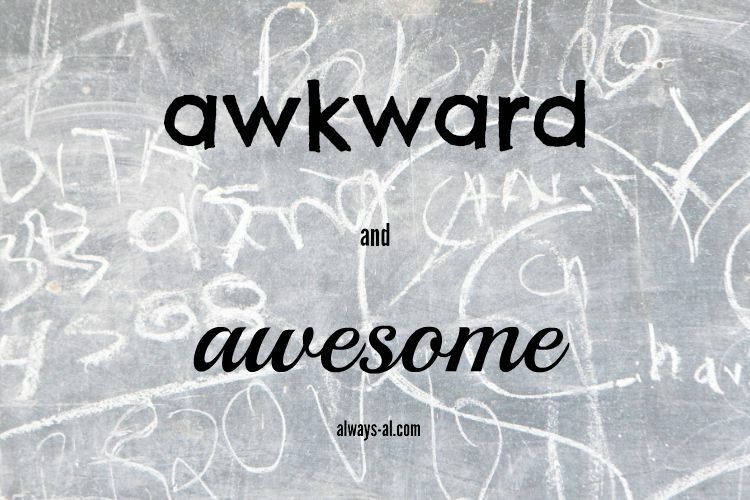 I'm very excited to end another month with Awkward and Awesome. We are getting increasingly busy as we get closer to our wedding and our big move to Pittsburgh. As I was making this list, I kept thinking of random awkward things. I had to edit, because even though I share a ton with you guys, you might not care that I've been binging The Office on Netflix for hours each night. -I really, really need to get back on the fitness train. I was doing so well for a long time, and managed to lose a bit of weight and tone up. The past few months have been a little crazy, and I haven't exercised one time. And I've developed an unhealthy Cheeze-It habit. -This is really more sad than awkward, but...Prince. Dave and I ate some cookies in mourning on Thursday night, and then he stayed up listening to records for a while. A Prince tune or five might have to make their way into our wedding reception. -The amount of times I turn RedBox movies in on time. Hint: never. -I booked my plane ticket to travel to Rochester for my bridal shower and bachelorette party! I can't wait to see all my family and friends the last time before the big day! -Dave and I went on a date last Wednesday and ate Mexican food after work. I may or may not have eaten a large amount of guacamole and tacos and enjoyed every minute. Also, margaritas with pineapple juice -- A+. -The feeling of getting rid of all the crap that you have accumulated over the years. I'm talking about things like cheap holiday decorations, old beauty products and clothes that don't fit. -This week I am getting a telecoil in my hearing aids. This will allow me to hear sound right through them when we are at events at many public spaces and theaters. I'm overly excited about this.